Award-Winning Composer Stephen Schwartz, his Creative Team and Cast Invite Viewers on a Behind-the-Scenes Journey to Set Sail on Schwartz’s First Musical at Sea. Magic to Do, Schwartz’s first production for a cruise line, celebrates his lifelong fascination with magic and combines thrilling illusions with some of his most famous songs. Last fall, Princess Cruises raised the curtain on a new musical revue titled Magic to Do, from the Oscar, Grammy and Tony award-winning composer of Wicked, Pippin and Godspell Stephen Schwartz. The show, a cruise industry first, premiered to rave reviews and today the cruise line debuted a special documentary, Magic to Do: The Story Behind the Magic, chronicling the journey of the show production from the partnership announcement, to auditions, to raising the curtain on the opening performance for Princess Cruises guests. 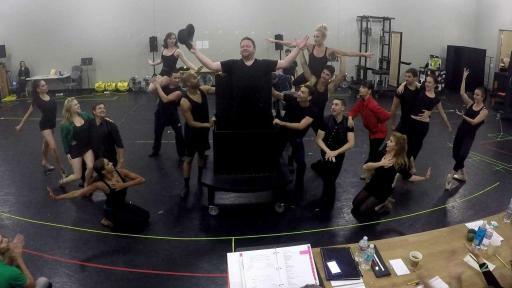 The new 25-minute documentary gives viewers a behind-the-scenes look at how the show came together through the direction and creative talent of Schwartz, as well as a cadre of Broadway and Hollywood talent, cast members and the Princess Cruises entertainment department. The documentary is available on the cruise line’s YouTube Channel and will also air regularly on Movies Under the Stars outdoor theaters and stateroom televisions across the line’s 17-ship fleet, as well as on princess.com. Magic to Do, Schwartz’s first production for a cruise line, celebrates his lifelong fascination with magic and combines thrilling illusions with some of his most famous songs, such as Magic to Do from Pippin and Defying Gravity from Wicked. The show also includes a brand new song written exclusively for Princess called A Little Magic. Brought to life by a vibrant cast, imaginative costumes and make-up, stunning scenic designs and baffling illusions Magic to Do originally debuted in the Princess Theater aboard Crown Princess in October 2015, and is now also available aboard Ruby Princess and Emerald Princess. The documentary chronicles the journey of the show production from the partnership announcement, to auditions, to raising the curtain on the opening performance for Princess Cruises guests. Gabriel Barre, internationally acclaimed director whose credits include the national tour of Pippin and the current Broadway musical, Amazing Grace, which will be touring the United States. Don Frantz, associate producer of The Lion King and Beauty and the Beast on Broadway, among many other Broadway and international accomplishments. Jeremy Railton, four-time Emmy winner whose extensive background in theatre, film, television and multi-media design includes the 2002 Winter Olympics opening and closing ceremonies and the Academy Awards. Mark Hartman, award-winning music director with numerous Broadway credits including Sondheim on Sondheim, Avenue Q and the national tour of Pippin. Jennifer Paulson-Lee, choreographer with credits including Enter Laughing, the Musical, A Rockin’ Midsummer Night’s Dream, 101 Dalmatians and Seussical. Alex M. Calle, art director on Warner Brothers Theme UAE, Galaxy Entertainment Macau and award-winning Crane Dance project in Singapore. Dominique Lemieux, costume designer to Cirque du Soleil including Mystère, Alegría and A New Day with Celine Dion. She also designed the costumes for Pippin on Broadway. Danny Fiandaca, sound design, having worked on various tours and productions, including Come Fly Away (Broadway), Catch Me If You Can (First National Tour) and Lonesome Traveler (Los Angeles). He’s also been associated with Princess Cruises for more than 10 years. Jim Steinmeyer, the mastermind behind many of the great magic illusions over the last 25 years, created the magic experience in Magic to Do. Steinmeyer has worked with some of the greatest magicians of all time including Doug Henning, Siegfried & Roy and David Copperfield. In addition, the film showcases the show’s original cast, including Stephanie Hodgdon (Eve), Danny McHugh (Pip), Michael Misko (Magic Maker), Kurt Robbins (Adam) and Courtney Stokes (Cat). Princess Cruises engaged producer, Shayne Fraeke of PREMIERE TV to make the film, which was directed by Igor Kovalik. During his 40-year entertainment career, Schwartz has won four Grammys, three Academy Awards for “Best Song” and “Best Score” for Pocahontas and “Best Song” for The Prince of Egypt and received the Isabelle Stevenson special Tony Award. He is the only songwriter in Broadway history ever to have three shows run more than 1,900 performances. The Story Behind the Magic features interviews with Stephen Schwartz, the creative team and original cast. This partnership with such a major creative talent from Broadway and Hollywood includes a multi-year collaboration to oversee the creative development of a total of four new musicals to debut across the fleet over the next several years. This adds to the cruise line’s “come back new promise,” designed to elevate the onboard guest experience resulting in more transformative moments, lifetime memories and meaningful stories to share from a cruise vacation. Princess Cruises partnered with Stephen Schwartz, the Oscar, Grammy and Tony award-winning composer of Wicked, Pippin and Godspell on the first-of-its-kind cruise industry partnership. Stephen Schwartz wrote the music and lyrics for the Broadway hits Wicked, Pippin, Godspell and The Magic Show. For film, he wrote the songs for the DreamWorks animated feature, The Prince of Egypt, and collaborated with composer Alan Menken on the songs for Disney’s Enchanted, as well as the animated features Pocahontas and The Hunchback of Notre Dame. He collaborated with Leonard Bernstein on the English texts for Bernstein’s Mass, and his first opera, Séance on a Wet Afternoon, was produced at Opera Santa Barbara and New York City Opera. Mr. Schwartz has been inducted into the Theatre Hall of Fame, the Songwriters Hall of Fame, and has been given a star on the Hollywood Walk of Fame. More information can be found at http://www.stephenschwartz.com/.